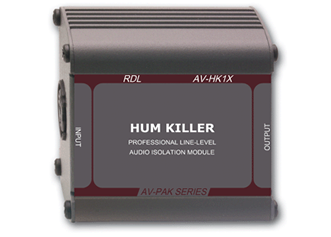 APPLICATION: The AV-HK1X is a mono transformer isolation module for use with a balanced, low impedance source and either a low or high impedance load. Input and output connections are provided on XLR jacks with gold plated contacts. The shield (pin-1) connection of the INPUT jack is electronically isolated from the case and from the output ground (pin 1) at audio frequencies. The ground (pin 1) connection of the OUTPUT jackis connected to the case shield. The user audio source, such as a mixer, preamplifier or other professional audio product, connects to the AV-HK1X input. The module output should be connected to the input of the grounded amplifier or mixer in the audio system.